Honda has become known as the leader in creating four-stroke engines that are reliable, technologically advanced and easy to start. Today, we offer a full line of engines, 1.0 to 24 HP in both horizontal and vertical shaft designs. Honda engines meet current CARB and EPA standards and offer enhanced performance, all with no change to existing external dimensions. And all Honda engines are produced in manufacturing facilities that are certified to ISO 9000 standards. When you click on the HONDA ENGINES link below you will go to the public web site for Honda Engines. 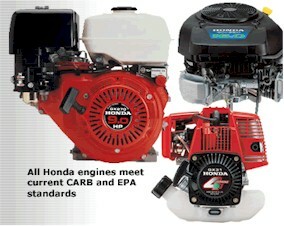 This is your portal for more detailed information about Honda Engines. When you have completed using the Honda Engines web site close the window by clicking on the X in the upper right-hand corner of the browser on the open Honda window and you will return to this page so that you may continue to view the Eastern Equipment Inc. website.